1) To record in-house use, select Circulation → Record-In House Use, click Check Out → Record In-House Use on the circulation toolbar , or press F6. 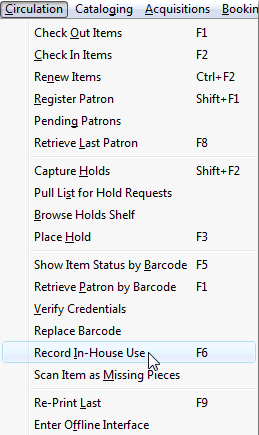 2) To record in-house use for cataloged items, enter number of uses, scan barcode or type barcode and click Submit. The statistics of in-house use are separated from circulation statistics. The in-house use count of cataloged items is not included in the items' total use count.